If you use Facebook to stay connected with your favorite sites, like My Frugal Savings, right! 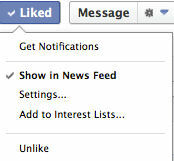 ;), have you noticed that you may not be seeing all the deals/posts in your Facebook News Feed? I’ve received quite a few comments from readers who are missing My Frugal Savings posts in their News Feed, (They basically said they haven’t seen me in a while!). If this is the case for you, here is an easy tip that will hopefully fix the issue on how to Find Your Favorite Pages on Facebook. Now, I’m not sure if this will work for everyone, if it doesn’t, please read how to add a page to your Facebook interests lists. 1) Sign-in to your Facebook account. 2) Go over to the My Frugal Savings Facebook page and click the “like” button (if you haven’t already). Hopefully this will help you see the hottest deals from My Frugal Savings and your other favorite bloggers in your News Feed! Also, keep in mind that at times I do post many other things on Facebook that does not make it on the My Frugal Savings site – like time sensitive deals that don’t last long, Amazon Deals that have a limited number left, some personal posts and pics, fun quotes and images, and much more! If you have any other Facebook Tips and Tricks please share them with us. Also, if you want to stay on top of all the latest deals and offers, be sure to sign up for My Frugal Savings free Daily Email Newsletter (just enter your email address in the box below! ).